I just started to take some time this morning to view a few presentations at the K12 Online Conference (free!) and first, I watched an “education” story by a student named Colby and then a presentation about a music class where kids are composing and creating all the time. A few weeks ago, I did watch Dean Shareski’s opening keynote (Sharing: The Moral Imperative) about the need for teachers to use the tools of technology for sharing their best practices, to help inform others. He argued that this is an obligation that we should have in the Web 2.0 environment — which supports the idea of lateral change — from teacher to teacher — as opposed to vertical change (administrator to teacher). Today, I heard student voices, not teacher voices, and that was fine by me. Colby’s story (The Life Practice Model) is intriguing because he transferred to a charter school where hands-on learning was central to everything, and he uses his interest and knowledge of technology for learning. Man, it is good to hear student voices telling us their stories from their perspectives, instead of us teachers (me, included) interpreting their learning through our pedagogical lens. Although the National Day on Writing was Wednesday, my students were still working on their webcomics at home, on their own time, in order to finish an assignment that we had to create a celebration of writing. I really loved what they were doing, so I decided to grab some of the comics and put them on a Glog Wall as a way to mark the 2010 Day on Writing. In thinking of use of technology, here we used Bitstrips for Schools to make the comics, a Firefox screenshot add-on to download the comics as images (I use Fireshot), Flickr to gather the comics together, and then Glogster.edu to present the comics. That’s a lot of use of tools, but what it comes down to is that the students were the ones creating content. The tools were just helpful. I am in the third year of some form of co-teaching, where I have teamed up with a special education teacher to collaboratively teach a Language Arts class where the student population is a mix of both those in the mainstream and those on educational plans. The first year, the partnership felt too harried. My co-teacher that year did her best, and I did my best, but we both agreed that it never quite clicked the way we wanted it to, mostly because we were on our own to sort it all out. Literally, we’d be doing planning when we met in the hallways between classes. She is a great teacher. Time was our problem. Last year, our special education teacher — Bob — taught with me every day for one of our four Language Arts blocks, and although we were still finding our way, it worked. The students in that class of high needs mixed with others on education plans were engaged, and they all benefited from one-on-one attention given by the both of us (at one point, we had three of us teachers — the third was our ELL specialist). Bob and I are at it again this year, and while there are still plenty of ways our co-teaching model could be a lot better (such as shared planning times during the day, which the administration has not been able to provide), I want to sing out the praises of my colleague, Bob, today. I learn something about teaching from him just about every day. He uses more visuals for learning than I do and he comes at our reading text from different angles. He’s folksy in his approach, with humor sprinkled amidst everything he does. He’s also not afraid to admit to the students when he doesn’t know something. I try to use parts of his teaching style with my other three classes, and it works. He’s a conduit between us in sixth grade and our colleagues in fifth grade. Bob is also a co-teacher in fifth grade, and so he brings ideas and strategies (and curriculum ideas) from them to us, and back again. I can’t stress enough how valuable this is. I have already seen an overall improvement in all of my new sixth grade writers because of the work done last year in fifth grade, and that is partially a result of Bob helping the fifth grade Language Arts teacher know some of the expectations of sixth grade (in a positive way) and letting me know what my fifth grade colleague is up to. We don’t get enough of that vertical communication. He’s not afraid to share the stage. The two of us, Bob and I, have a good mix of personalities, I think (so, maybe he feels different … naw), and both of us willingly and often cede the floor to the other, so that class is mostly a seamless flow between two teachers. He is not an aide. He is not support staff. He is the teacher. The core of his teaching is all about differentiated learning. Since his main focus and years of experience has been with students with learning difficulties, Bob’s style is to come at teaching from all angles, trying to hook learners of all styles. We can talk about differentiated learning all we want, but I get to see it in action with Bob, and I tuck away his ideas. He’s not afraid to try something new, and see what happens. And he’s reflective in his practice. We’re revamping the focus of ELA, together. Last year, after looking over various student data, we saw some real weaknesses overall in students when it came to reading, particularly around responding to literature. So, Bob and I began the task of revamping our curriculum. We created an adaptable rubric, began modeling writing responses, and developed (and still are) lesson plans that help our students push themselves as writers. Having Bob as a partner in that has been incredibly valuable. He values my ideas and teaching practices. It used to be that the students who were in pull-out special education services would be in an entirely different world. Bob (along with his colleague, Stacey) has changed that for our sixth grade. Not only does he bring ideas from the Learning Center into the mainstream classroom, but he is constantly pulling ideas from my classroom (mostly around writing and technology ) back into his smaller group Language Arts sessions. Those students don’t feel left out; they feel they are part of what we are doing in the larger classes. I know I still have a lot to learn about sharing the classroom, and being open to the negotiations around learning. I hope I am doing better at that this year than I was last year. I realize, too, that it helps that Bob is a friend, and that we get along. If my co-teacher were someone that I struggled with on a personal or professional level, our system would not work, because it is built on conversations, sharing and trust. The fact that we don’t have a formal structure in place for co-teaching worries me. So, Bob, don’t go anywhere, all right? 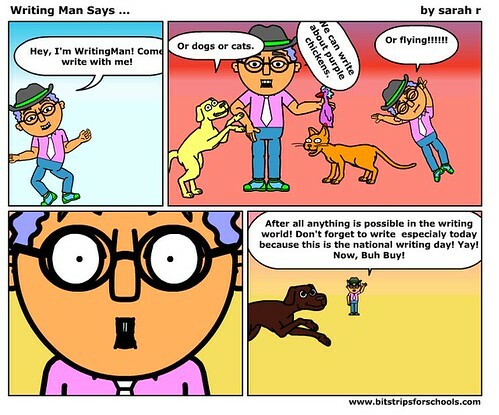 Yesterday was the National Day on Writing (did you get my Hallmark greeting card? No? Must be in the mail) and I had imagined some school-wide event at my school, but that fell apart when I realized the scale of such an operation. I didn’t have the energy, I guess. But we did celebrate the Day on Writing in sixth grade, as I had all of my students (about 80) head to our Bitstrips Webcomic site to create a webcomic that celebrates writing. I helped get them started by creating an activity template that they could follow with a character I invented called WritingMan. Not everyone finished during the class (some continue to get wrapped up in the joy of creating characters — it’s time-sucking fun) but I was happy to see how engaged they were and how thoughtful they were about writing. PS – Yesterday I wrote a poem, and share the podcast, about the Day on Writing, so I was involved on a few levels with the event. In honor of today’s celebration as the 2010 National Day on Writing, I decided to compose a poem. is what keeps it alive for those behind you. What will you do today to celebrate writing? My blogging friend, Franki, at A Year of Reading, wrote about the brainstorming ideas behind self-reflective readers. She had students trying to create a list of 100 things that explain them as readers, and then she did the same. She noted that almost no one got to 100 on their list, but maybe the list is always growing? The first book I remember reading independently was Hop on Pop by Dr. Seuss. When I was a kid, the trip to the town library used to make me so excited, I always had to use the bathroom when we got there. Always. I used to collect comic books, more for the characters than for the art. My favorite comic book series was called “What If …” that morphed stories together in strange ways. One of my favorite book series as a kid was Encyclopedia Brown mysteries but I could never figure out how to solve the mysteries. My mom read all the time and there were books everywhere in our house. One of my best memories of read-aloud was my mom reading Charlie and the Chocolate Factory and Charlie and the Great Glass Elevator to my brother and I on our couch. On rainy days, my mom would make us go read and we could not come downstairs until we had read at least three books (or three chapters). She read then, too. In High School, I took a Power Reading course, which in later life played a huge role in being able to skim through informational text with ease. I didn’t like the Hardy Boys all that much as characters, but I read just about every book in the series because I loved book series that never seemed to end. We used to travel to a used book shop called The Red Barn, which was this massive old barn filled to the brim with books. I loved that place. I read Archie comics but never understood the girls (such was life). It wasn’t until college that I read a poem that I enjoyed and could understand. I was stunned to find Bruce Springsteen’s Born to Run lyrics in a college text for poetry and then came to read lyrics a bit more closely. As a saxophone player, I read notes pretty fluently but is that the same as reading words? I picked up a book of Bob Dylan lyrics once (and still have it) and read it as a text, without the music in my head. My childhood mornings were often spent reading the backs of cereal boxes. They seem so less inventive these days. I had to write a play skit myself in order to appreciate the literacy elements of reading a play. For a long time, I only wanted to read science fiction. Then, I moved on to mysteries. Now I try to mix it all up so that I am always off-balance with my genre expectations as a reader. Why do movie versions of books I like always disappoint me? The most difficult thing I ever read was an obituary, for a close family member. I read it once and then packed it away. Long after I had forgotten about comics, I came to rediscover graphic novels and found beauty and power in the good ones. The best thing about being a staff writer for a site that reviews graphic novels it that every so often, a huge box of books arrives on my doorstep, and my sons and I wrestle over who gets to look at which book first. Sometimes, when I am stuck writing a song, I pull words and phrases and plot lines from my memory banks of books that I have read as inspiration. Reading the scribbles, lines and swoops of my sons while they were emerging writers is a wonderful mystery: what is that word? They know and I need to figure it out. I think I am pretty adept at “reading” people. I read this bumper sticker for a local bookstore that is like The Red Barn — it’s a farmhouse on a river in a town not easily accessible — that stated: “Books you don’t need in a place you can’t find” and thought that was a brilliant way to capture the place. I wonder about my reading when I have jumped through five hyperlinks and completely abandoned the first page where it all started. I submit stories to short story contests but then never read any of the winners. They don’t often interest me. Or maybe I am just jealous that it wasn’t me. I need to read every night before I go to sleep, or else I don’t sleep very well. When I am at the beach, I sneak peeks at what people are reading. I can’t help myself. Becoming a teacher allowed me to read young adult fiction again and I love that. I love wordless picture books, where the art is what you read. Reading political signs on people’s lawns is interesting because it gives you some insight into the neighbors you think you know, and may not. Mostly, I read magazines during the day and novels at night. If I owned a bookstore, I would have cats that would lounge around in the sunny window amidst the books because that scenes says something to me about the joy of reading. I was a newspaper reporter for a long time and now, when I write by hand, I can’t read my scribbled notes if any amount of time has elapsed. Movies with subtitles that I have to read while watching doesn’t suit my fancy all that much. I’ll do it but only if the movie is really engaging. When an author I like puts out a new book, I lose my sense of conservative monetary policy and usually splurge, even though I should wait for the library to get it. One of the worst thing that I imagine happening to me is losing my ability to read, like that guy in the Twilight Zone episode who crushes his reading glasses. I don’t get the same pleasure out of audiobooks that I do out of reading books myself. No magazine I get on a regular basis lives up to the excitement I first experience when seeing it in my mailbox. Why is that? I used to read the newspaper first, and then check my email and read online. Now, I read online first and then look at the newspaper. Things change. I do enjoy non-traditional books done in the form of epistolary (letters, notes, memos, emails, etc) style so that the story unfolds along different crevasses. I love reading The Onion news because they skewer headlines, which is an art unto itself, really. I’m more likely to abandon a book now that I am older than I was willing to do when I was younger, and I’m not sure which is better (slogging it out or waiting for the magic). Yesterday, I wrote about our keynote speaker at the Massachusetts New Literacies Teacher-Leader Institute. Tom Daccord inspired us to think about learning and communication in the changing world. Today, I am going to do a post of lists that came out of the day-long institute on Friday (which was a follow-up to a week in June). Grappling with filtering issues — to be open or to be closed? Reviewing acceptable use policies — reflect the current environment? Or outdated? Yesterday, we had a follow-up session to our week-long Massachusetts New Literacies Teacher-Leader Institute that we held back in June (I am one of the teacher leaders). We had about 100 participants return yesterday, and my hope is to slowly reflect a bit on some of things that took place. Here is part one, the keynote address entitled Building Complex Communications. Tom Daccord (@thomasdaccord), of EdTechTeacher, took the stage and immediately energized us with a long-view look at how literacies in the workplace have shifted since the advent of the Personal Computer and what that shift towards critical thinking skills should be doing to our teaching practices in the classroom. Tom called these skills as the Complex Communications (the ability to explain a complex idea to others) and Expert Thinking (identifying a new problem and finding a solution to it). Tom notes that employers “demand and expect that employees come to the workplace with these skills. ” That means that we, as teachers, have be setting the groundwork for critical thinking, and while computers can do a lot for us (and in fact, have reduced the need for much manual labor), it is our human ability to be literate on a social level (read emotions, have empathy, etc.) and make different kinds of connections between disparate information to find solutions that is the key. “Put a computer in a situation with no new data. It will flounder. It cannot adapt. What can adapt (to situations where there is not new data)? We can,” Tom explained. He then launched into a discussion about the importance of teaching multi-modal literacy, and of finding ways to use an authentic audience for students as writers and producers of content. The world will demand these skills of them as adults, and we need to foster these skills in them as young people, he explained. “We’re missing the cultural shift going on,” Tom said, explaining the rift between the literacies of the lives of young people outside of the classroom and the way we teach them in the classroom. This system “relegates publication only to the eyes of the teacher” when there are so many ways for students to step up and publish to the world. Tom then exorted us — the participants of the New Literacies movement who were in that room with him — to be the ones who make the change that needs to occur in the classrooms, in that it won’t happen as a top-down approach. Instead, it needs to be teacher-to-teacher. “Real change happens horizontally. It happens colleague-to-colleague. It be you, going back to your school,” he said, and this message helped frame the rest of the day’s work around technology and classroom practice. I’ll try to share out parts 2 and 3 over the next few days. This is a video of some NWP folks who went to DC to talk about digital writing. I’m proud to be part of this network of smart people.